Glitretind at the Stein Eriksen Lodge Deer Valley boasts an extensive Sunday Brunch with impressive views of the slopes. Weekly offerings vary but you can expect a wide array of salads, pastries, entrees, and desserts in addition to omelets and waffles made to order. Stein Eriksen Lodge is one of the most upscale and prestigious hotels in the area, named for the Olympic alpine skier who recently passed away at age 88. It can be hard to find a meal that pleases every member of the family. But who doesn’t love pizza?! 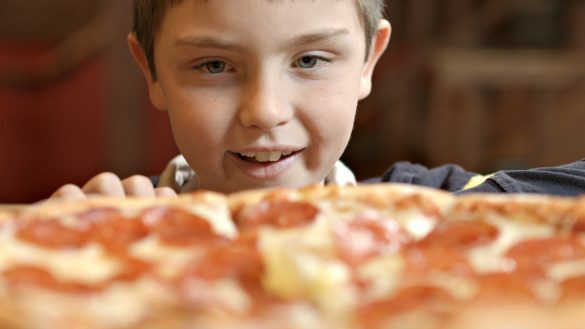 Warm up with the kids at Red Banjo Pizza Parlour with a few slices of cheesy goodness. Red Banjo is the longest running family-owned business in Park City. The Toly family has been making hand-tossed pizzas on Main Street since 1962. Try the local favorite, the Red Banjo Special, topped with Canadian bacon, pepperoni, beef, sausage, onions, fresh mushrooms, black olives and green peppers. Squeeze a lemon over your slice for a tangy twist. 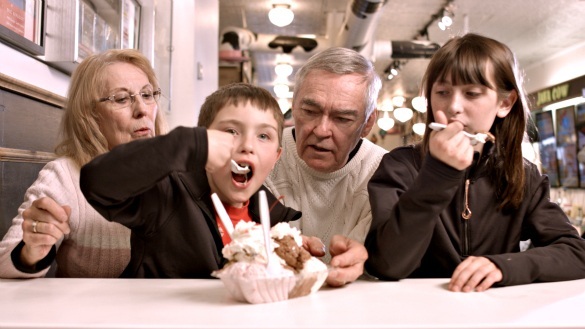 No matter the temperature outside kids love ice cream, especially at Java Cow on Main Street. Dig into a scoop of Zowy Cowy (vanilla ice cream with toffee, dark chocolate chunks and a caramel ribbon) or one of their numerous other wacky or traditional flavors. Looking for something warm? Order one of their sweet or savory crepes with a hot chocolate (or one of their specialty coffees, for the grown-ups). Decked out with spotted cow decor, you can purchase all things cow-related and kitschy from their gift shop. 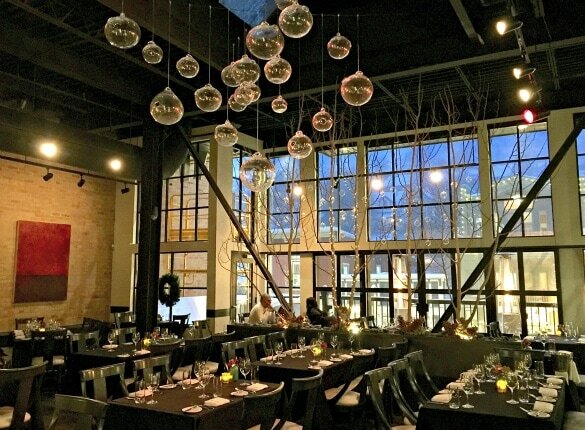 For an upscale date night in Park City, Utah – reserve your table at Riverhorse on Main. Expect elegant decor and menu options, like oysters (served on the half shell or Rockefeller), seafood, sizable steaks, and specialties like Crispy Duck and Oxtail Ravioli or a Trio of Wild Game (buffalo, venison chop and elk). 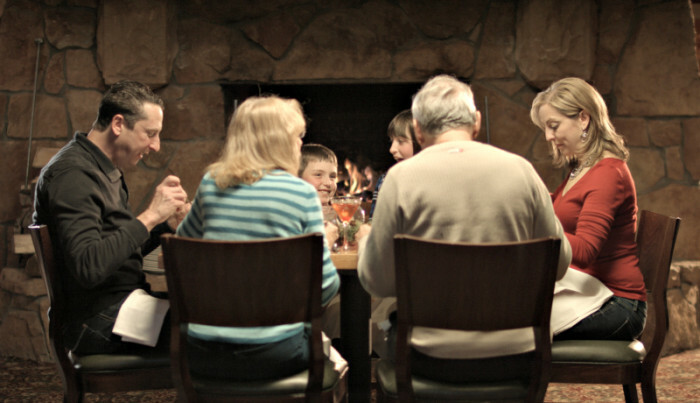 For a meal you will long remember after the ski boots have been packed away, book a Fireside Dining experience and sleigh ride at Deer Valley Resort’s Empire Canyon Lodge. Enjoy four courses served from stone fireplaces, including warm Swiss raclette cheese, cured meats, salads, specialty entrees, hearty sides, fire-roasted leg of lamb, fresh baked breads and dessert fondues. After our raclette dinner inside the lodge, my family bundled up and sang Christmas carols together as our sleigh horses’ bells jingled along. It was one of the most joyous and memorable experiences of our visit to Park City, Utah. 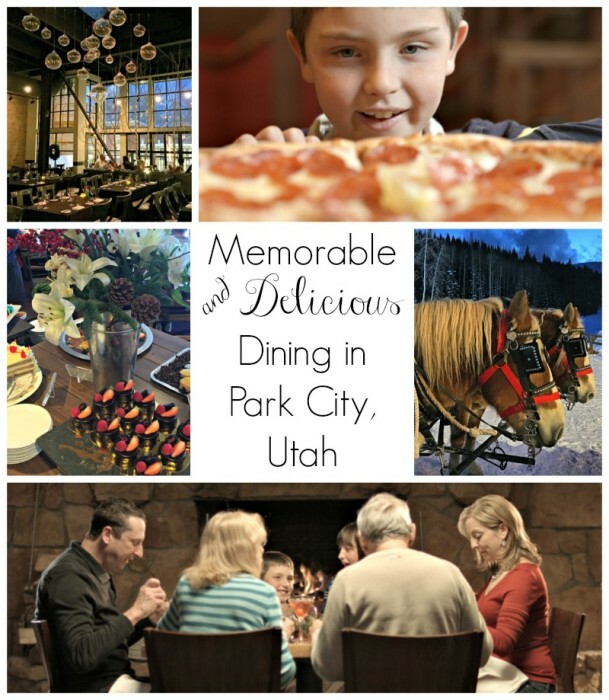 Which of these restaurants for families in Park City, Utah appeals to you most? Let us know in the comments below! 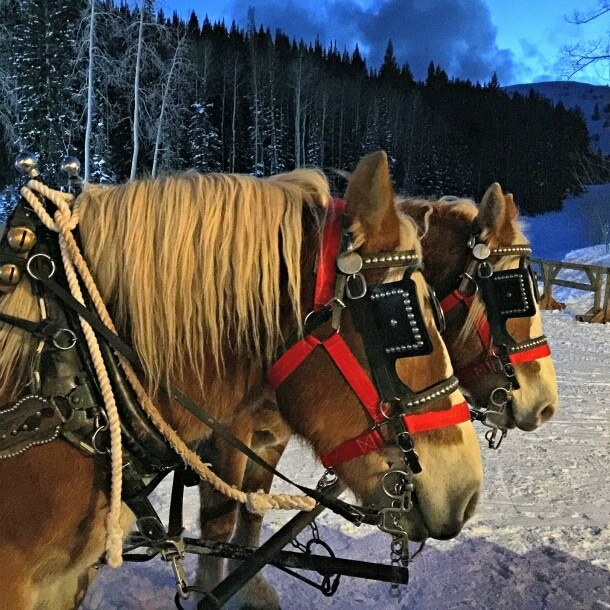 A Note from The Travel Mama: Thank you to NBCUniversal for supporting my discovering of Park City, Utah. I received compensation related to this post. All opinions are mine, as always. This story includes affiliate links. Your clicks and purchases help TravelMamas.com remain a free resource for readers like you. There are so many restaurants to choose from in Park City! It’s good to have a narrower list of local places to choose from. We are headed for Deer Valley’s Seafood Buffet this weekend. My husband has been wanting to try it for years. The seafood buffet sounds delicious! Hope you had a great time in Park City, Allison! These all appeal if I’m honest! But I’d have to go for the brunch as top of my list as it’s probably my favourite meal – I love all the choices and never really do anything like it at home. I always think of it as a holiday treat. 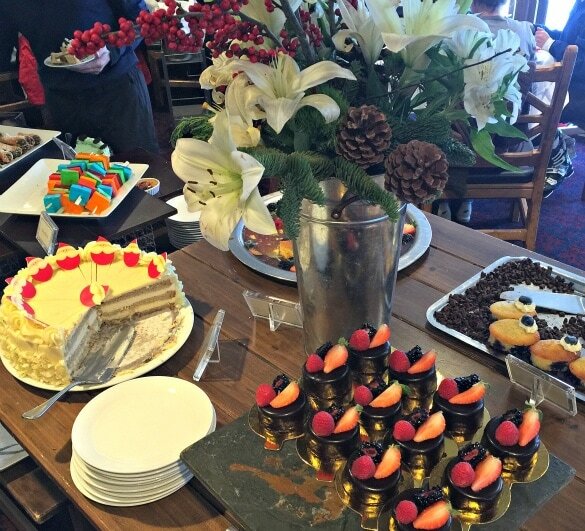 Yes, there’s something that feels so decadent about a brunch buffet…especially when it’s at the Stein Eriksen Lodge! This place looks so dreamy for food, from the lights to the horses to the desserts! I’ve been wanting to go to Utah with our whole family, so I’ll need to add Park City to the list! Lillie – Indeed Park City deserves a spot on your Utah must-do list! That buffet brunch looks lovely, but I also love the decor of River Horse on Main! Fun article! They were both yummy! Thank you for your comment, Jolanta!